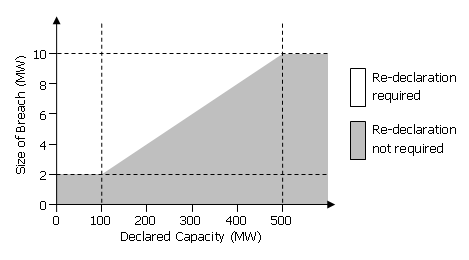 Each BM Unit has a Generation Capacity (GC) and a Demand Capacity (DC). This is the maximum expected net Generation and Demand for that BM Unit in the current BSC Season. These values are declared seasonally. Parties can make resubmissions during the Season if they breach these declared values. GC/DC is used to calculate whether a BM Unit is a Production (P) or a Consumption (C) BM Unit, which determines which Energy Account that BM Unit’s Metered Volumes are allocated to. If BM Units form a Trading Unit, the GC/DC values are used to determine the P/C Flag for all the BM Units in the Trading Unit. For most BM Units, GC/DC is also used with Credit Assessment Load Factor (CALF) in the Energy Indebtedness calculation until II data is available. When should I declare GC/DC values? Initial Registration: When you register a BM Unit, you will register its GC and DC values for that Season as part of that process. Seasonal Declarations: You need to declare your values for each subsequent Season before they start, with the deadline being ten Working Days before the Season begins. If you do not submit your values by this time, you will be in Default of the BSC. Mid-Season Re-declarations: All BM Units can opt to re-declare their GC or DC values upward in magnitude at any point during a Season. You need to re-declare your values for a BM Unit if it breaches the current ones. Supplier (2_) BM Units can also opt to re-declare their DC values downward in magnitude during a Season, and this can be done twice per BM Unit in any Season. When is the deadline for submitting the next Season’s values? The deadline for submitting a Season’s GC/DC values is ten Working Days before the start of the season. You can still change your values with a mid-Season re-submission, but you will only be able to increase the values in magnitude, except for Supplier BM Units, where it is possible to decrease the magnitude of the DC value. How do I declare GC/DC values? Seasonal declarations are done using form BSCP15/4.3, and mid-Season re-declarations are done using form BSCP15/4.4 found here on the BSCPs page. These forms should be sent to the Central Registration Agent (CRA) either by email to mailto:neta@imserv.com or by fax to 0870 833 5601. You need to be a Category A or F Authorised Signatory to submit these forms. For more information about Authorised Signatories, please see BSCP38 ‘Authorisations’. What could be the impact of re-declaring GC/DC? If you re-declare GC or DC then this may result in a change of the BM Unit’s P/C Flag. If the BM Unit is a part of a Trading Unit, then the Flag of all the BM Units in the Trading Unit may be affected. This would affect which Energy Account the BM Unit’s Metered Volumes are allocated to, and if this were to change, any Metered Volume Reallocation Notifications (MVRNs) associated with that BM Unit would be automatically end-dated the day before the Flag would change. If the GC or DC value is used as part of the Energy Indebtedness calculation, you should also be aware of how this might affect your Credit Cover. If the Capacity increases in magnitude, you may find your Indebtedness will go up once that enters the calculation. What happens if I breach my GC/DC values? During each BSC Season, the Central Registration Agent (CRA) will perform automated monitoring of GC/DC breaches. If a BM Unit’s Metered Volumes exceed the declared GC/DC by more than the permitted thresholds (listed below), the CRA will calculate a replacement GC/DC value for the breaching BM Unit. The replacement GC/DC value will be made effective from the next working day. The Lead Party for any BM Units that have breached their GC/DC values will be notified via email and will have the opportunity to appeal a replacement GC/DC value if they believe it is incorrect by emailing SettlementOperations@elexon.co.uk . Appeals must be raised within two full working days of receiving a breach notification. More information on the GC/DC breach calculations and appeals process can be found in the Generation Capacity (GC) and Demand Capacity (DC) Estimation Methodology and Challenge Guidance. 10MW if the Capacity is greater than 500MW. The current GC and DC values for all BM Units can be found in the Registered BM Unit spreadsheet on the ELEXON Portal.